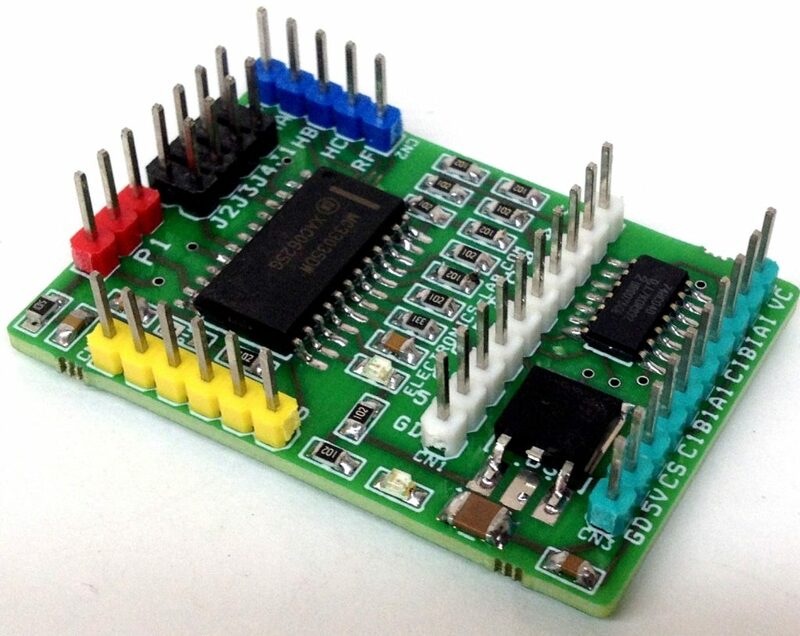 The board shown here is a breakout board for MC33035 brushless motor controller. 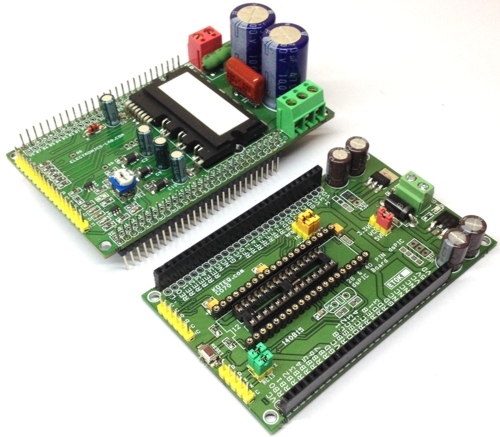 It requires an output buffer IPM module or Mosfets to complete the closed loop brushless motor driver. 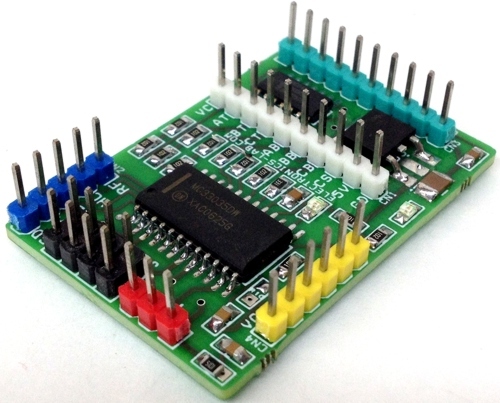 MC33035 IC is the heart of the project; the project provides 6 PWM pulses as well 6 Inverse pulses outputs. On board Jumpers helps to change the Direction, Enable, Brake, and 60/120 phasing Header connector provided to connect the Hall sensors and supply, on board LED for Power and fault, P1 potentiometer helps to change the speed. 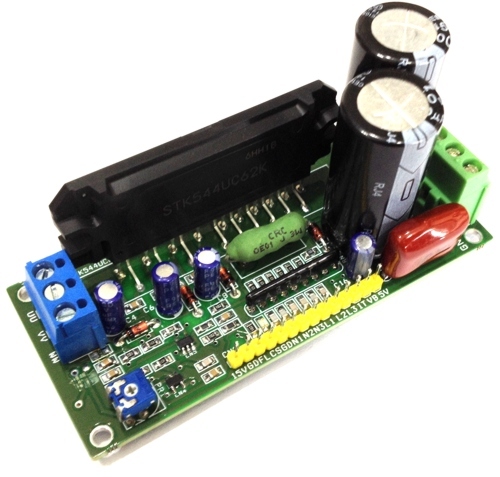 The MC33035 is a high performance second generation monolithic brushless DC motor controller containing all of the active functions required to implement a full featured open loop, three or four phase motor control system. This device consists of a rotor position decoder for proper commutation sequencing, temperature compensated reference capable of supplying sensor power, frequency programmable saw tooth oscillator, three open collector top drivers, and three high current totem pole bottom drivers ideally suited for driving power MOSFETs. 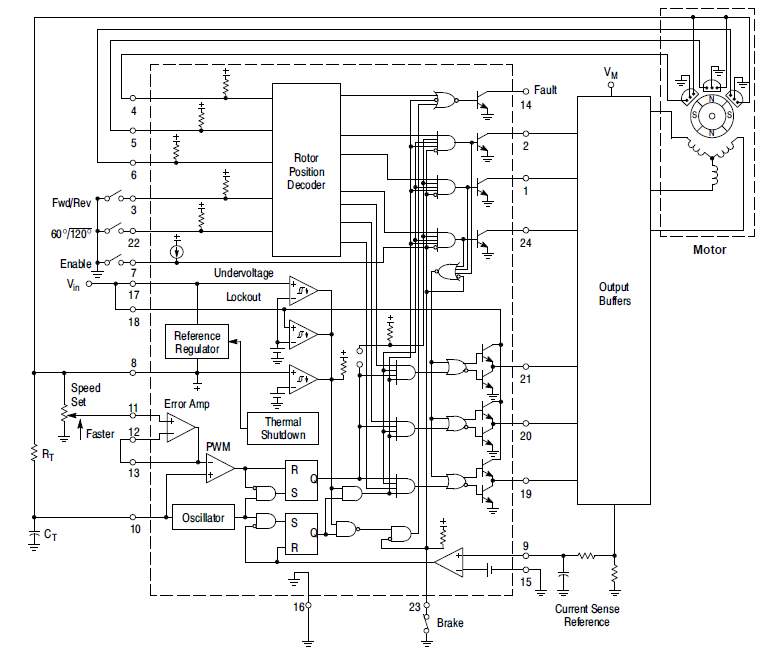 Also included are protective features consisting of under voltage lockout, cycle−by−cycle current limiting with a selectable time delayed latched shutdown mode, internal thermal shutdown, and a unique fault output that can be interfaced into microprocessor controlled systems. 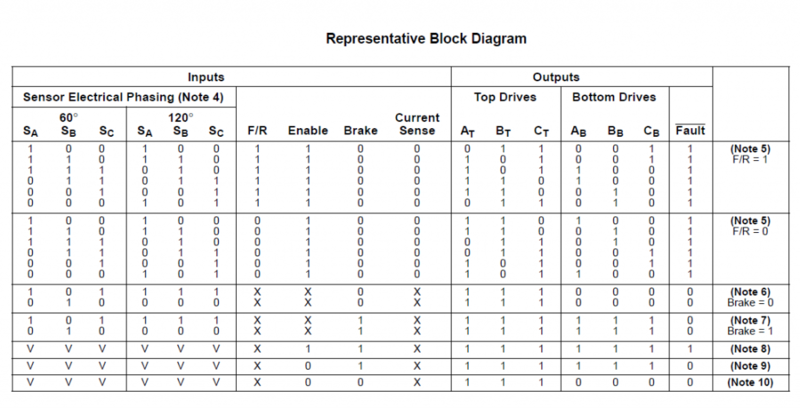 Typical motor control functions include open loop speed, forward or reverse direction, run enable, and dynamic braking. The MC33035 is designed to operate with electrical sensor phasings of 60°/300° or 120°/240°, and can also efficiently control brush DC motors. drive outputs. 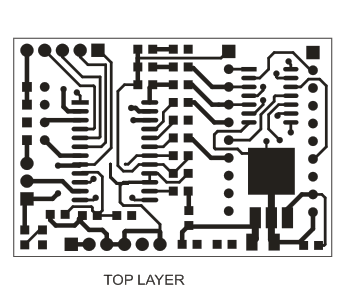 When grounded, the top drive outputs turn off and the bottom drives are forced low, causing the motor to coast and the Fault output to activate. Dynamic motor braking allows an additional margin of safety to be designed into the final product. Braking is accomplished by placing the Brake Input (Pin 23) in a high state. 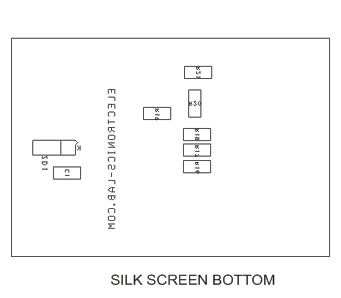 This causes the top drive outputs to turn off and the bottom drives to turn on, shorting the motor−generated back EMF. The brake input has unconditional priority over all other inputs. The internal 40 kΩ pull−up resistor simplifies interfacing with the system safety−switch by insuring brake activation if opened or disconnected. The commutation logic truth table is shown in Figure 20. 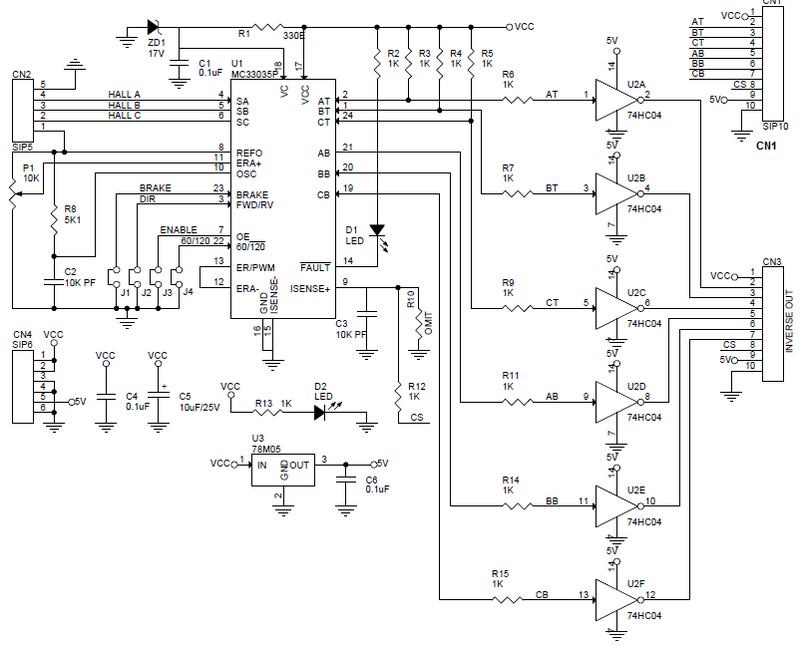 A four input NOR gate is used to monitor the brake input and the inputs to the three top drive output transistors. Its purpose is to disable braking until the top drive outputs attain a high state. 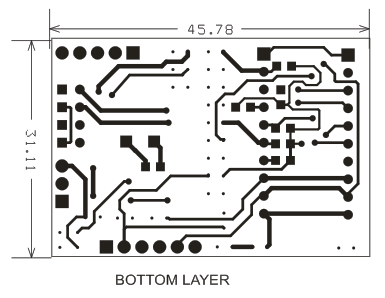 This helps to prevent simultaneous conduction of the the top and bottom power switches. 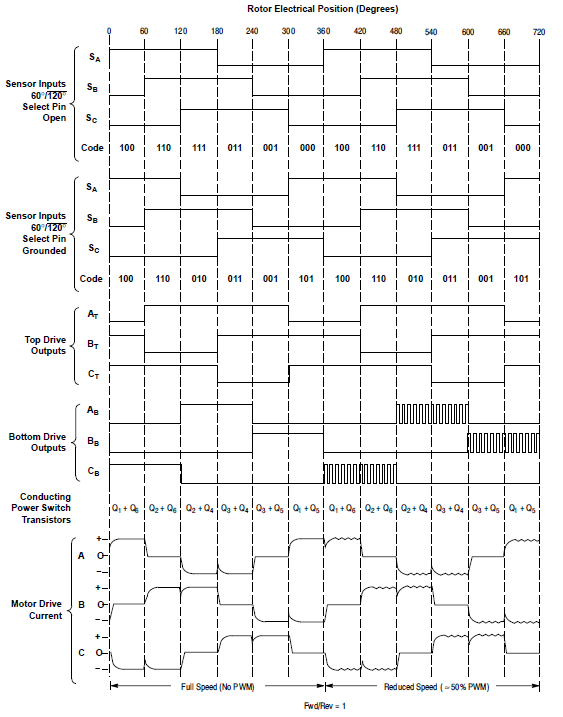 In half wave motor drive applications, the top drive outputs are not required and are normally left disconnected. Under these conditions braking will still be accomplished since the NOR gate senses the base voltage to the top drive output transistors. The Fault output activates during an over current condition. The dual−latch PWM configuration ensures that only one single output conduction pulse occurs during any given oscillator cycle, whether terminated by the output of the error amp or the current limit comparator. It depends on the output buffer you will use. 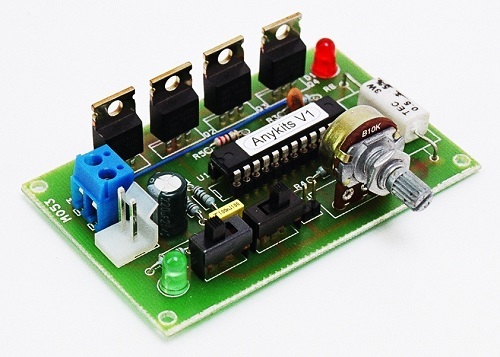 This board will only produce the required control signals and you need to use a power output stage. Do you sell it the boards? May I know the dimension of this boards ? 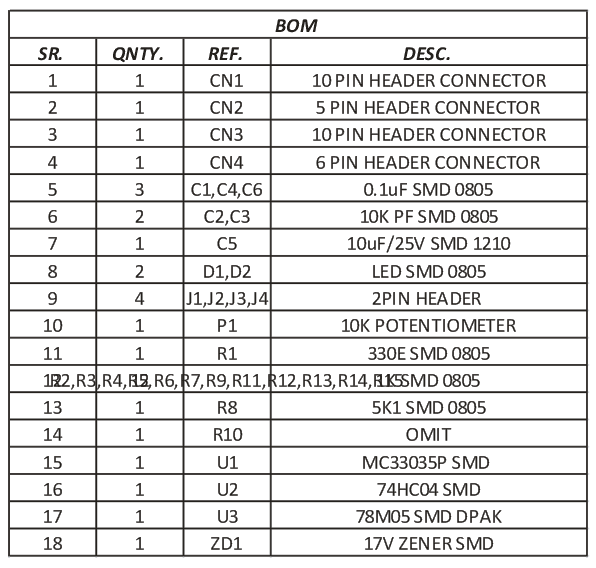 Can you build a BLDC motor driver based on UCC3626 ? 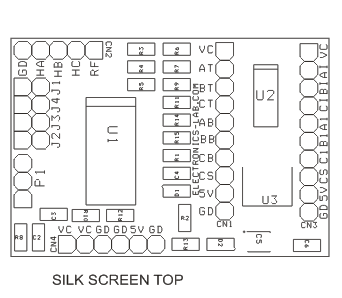 Yes, we have a project based on UCCC3626 which will be published on our website soon.